description for "Dahlias: Dahlia 'Sisa'"
Dahlia 'Sisa'. ADS classification - MFD. 4" bright yellow blooms. 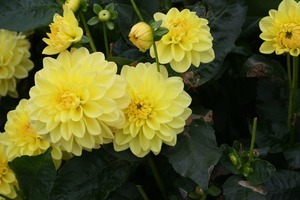 Dahlias are hybrids and for best results should be grown from tubers, cuttings or transplants. Seeds are unreliable for the plants to be true to type. Plant in the spring after danger of frost has passed. Dahlias require a sunny spot with, rich, well drained soil. Plants should be staked and will bloom until frost. For best flowers, disbud by removing two of the three blooms at the end of each branch. Hardy in Zone 8 and south and can over winter in the ground. In colder areas, lift tubers and store for the winter. reviews for "Dahlias: Dahlia 'Sisa'"